The track was completely re-surfaced for the 1976 season. The impetus for this being the staging of the Superstox World Championship in August. Notable event on 02.05.76 was starter Mike Grainger's 3000th race start. The average attendance for the season in the Saloon Stocks was 26 cars up one from the previous year. The Superstox average was 18 up two on last year and lastly even the Hot Rods were up one at 8. The biggest attendances for the Saloon Stocks and the Superstox with 35 cars both at the World Superstox meeting. For the Hot Rods it was 12 cars for the Open Scottish. In the programme 06.06.76 Gwen made the big statement that whatever the weather come The World Superstox Championship, that we (Scotland) will win the World Title this year. Ian Fraser made some interesting observations in the World Championship meeting programme. 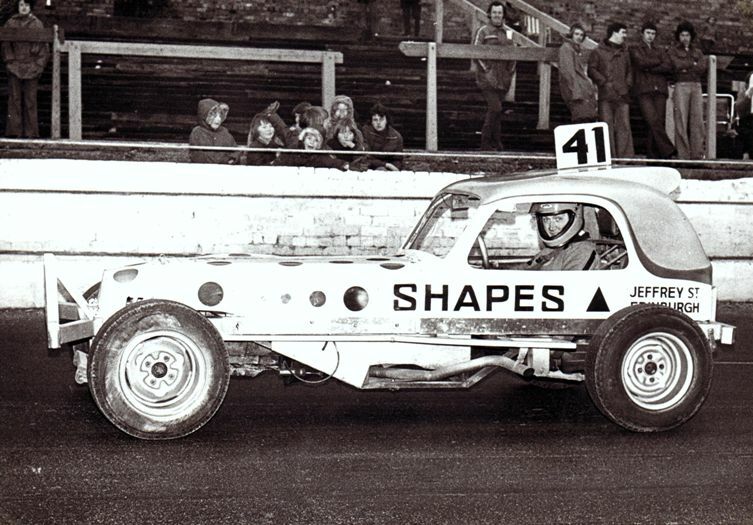 The World Championship was held on the 11th anniversary of the first ever stock car race held at Cowdenbeath 15.08.66, won by Peter "Pepso" Dent. Two of the World Finalists Gordon McDougall & Les Clark raced at the opening fixture. Willie Strang was still operating as Pit Marshall & Alan Smith was still Clerk Of The Course. 15000 fans turned up for the World Superstox Championship. The grid positions were determined by an all in draw with eventual winner Gordon McDougall being drawn half way down the 26 car field, so it was certainly not handed on a plate. 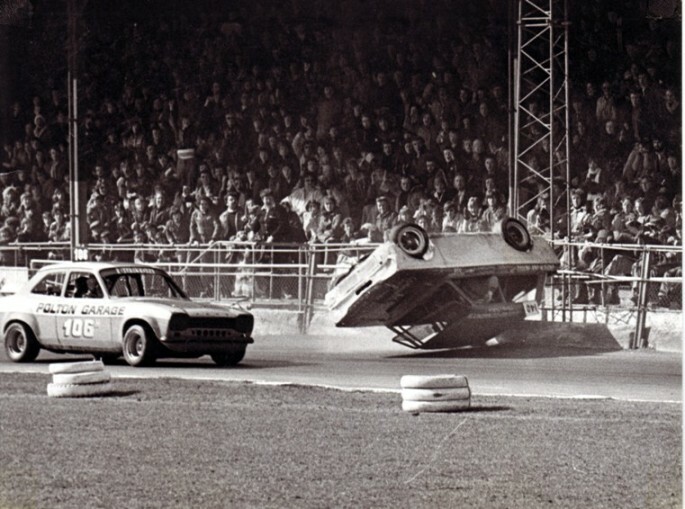 As the race got underway Belgian Jetje Rejen was involved in a bad clash with Les Brown & Bob Perry, Jetje rolled his car & the race was stopped to release the injured driver. On the re-start Bob Morton hit the lead & then Howard White took over. Bill Pullar was next man to make it to the front when Howard went wide into some dead cars, Gordon McDougall was right on his tail. Gordon took the lead with more than half the race still left to run. Bill pressed him hard & Gordon had a couple of clashes with the fence damaging a wheel. Neil Bee was also closing in on both of them until delayed slightly by a backmarker. Gordon held on to the flag and the Cowdenbeath "Roar" which grew as the laps wound down grew to a crescendo at the fall of the flag - one of life's most memorable moments. 15 41 Gordon McDougall 16 NI 7 Ray Clifford? The 1976 Superstox Scottish Championship raised the prospect that for the first time a driver would have their names on the trophy twice, Les Brown having dominated the previous two meetings by some margin. 18 competitors turned up for the meeting, but only 13 were able to run in the actual championship. In the event another new name was added to the cup, Bill Pullar coming through from Bob Morton & Les Brown. The UK Challenge Cup was the last international race for the 1976 season. Bill Pullar the winner. Gordon McDougall provided the strongest opposition. Bill streaking into the lead from his front row draw position, Gordon gradually moving through the field and eventually getting on to Bill's tail. 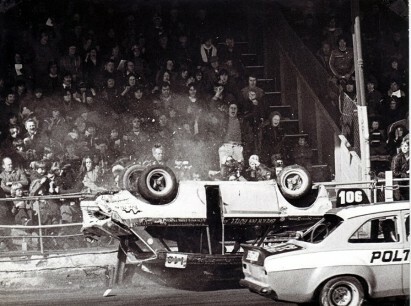 The resultant contact saw both cars hit the fence, Bill recovered still in the lead, Gordon had to retire. 1975 World Champion Neil Bee came from last on the grid to finish 2nd & Bob Morton collected 3rd. This was a fantastic drive from Bill as Neil is a definite candidate for the greatest Superstox driver of all time, having won the World Championship in 75, he went on to win it again in 81, 82 & 86.Neil was a great supporter of racing in Scotland, making many visits north. He had commenced racing in 1971 while still only 16 years old. 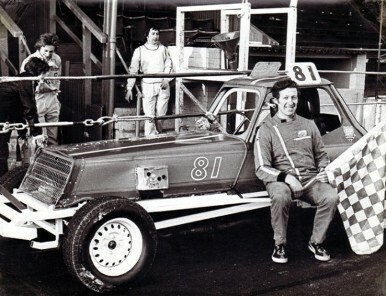 But his stock car racing didn't start there, he was helping Superstox driver John Gray from the age of 9! He reached red grade after only 4 months and he raced every year through to 1991, when tragically he died at the age of only 36, through cancer. The East Of Scotland Championships resulted in a couple of interesting results. Mike Jack taking the victory with driver of the year Bill Pullar right on his tail. Jimmy Cochrane scooped up the Saloon Stock honours after Charlie Milne's Cortina packed up when enjoying a huge lead, driver of the year Robert Bruce came through for 2nd. Hamish Buchanan won the Hot Rod title from Kenny Ireland in 2nd. The 2nd May meeting witnessed a crack down on the effectiveness of the Saloon Stocks brakes. It would seem that the rear breaks on New Scottish Champion Charlie Milne's car had been disconnected. His car therefore failed scrutineering. Charlie was having none of this though, & he duly came out to race & would not leave the track. As happens in these sorts of events, the spectators love it & the officials hate it! Charlie ended up with a months ban from the BOC for his trouble, & a severe reprimand from Gwen in the following weeks programme "disgraceful behaviour" no less. Charlie returned on 06.06.76 after his months ban, graciously Gwen included his photograph in the programme under which was the note "All Is Forgiven". It is no wonder that so many drivers remained so loyal to the promotion, it was like an extended family! Anyway Charlie secured a 4th place in the 2nd heat & 3rd in the final behind winner Tommy Davidson & 2nd pace Fraser Dunlop. The saloon stocks tried hard to steal the thunder from the Superstox in the World Championship meeting, 35 cars started the first heat, Charlie Milne though was unstoppable taking both heats & final. The new track surface was also hoped to increase interest in the hot rod formula, ie one of the perceptions for the large numbers of accidents in the formula was the condition of the track surface. The following meeting attracted 4 entries, accidents still occurred with only 2 cars finishing the 2nd heat. Another ongoing excuse for low numbers of entries was lack of parts, however at the 3rd meeting of the season the flu epidemic joined the list of contributing factors. 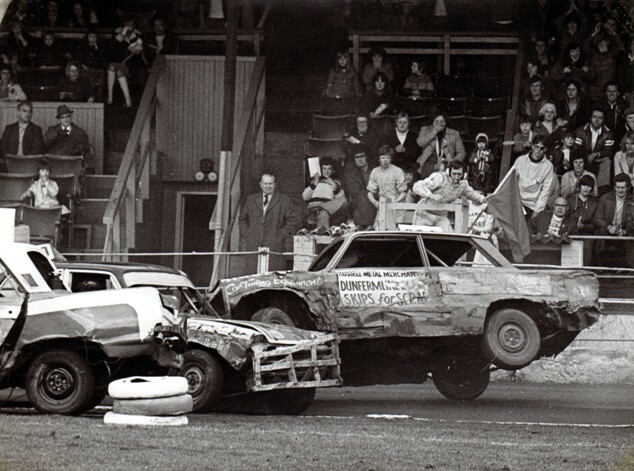 It was unfortunate that Hot Rod drivers succumbed to the flu more than Superstox, Saloon Stocks & Banger drivers. The promoters eventually lost patience & it was announced that the Hot Rods would be restricted to two races only, until further notice. This decision lasted precisely one week, the huge number of 6 cars fronted up for the next meeting & 3 races were re-introduced. 3 cars finished the final. We all have our favourite formulae. I am a big Hot Rod fan, however not so much at Cowdenbeath. Hot Rods can be absolutely brilliant with large fields at appropriate tracks. Ipswich & Hednesford in particular produced fantastic Hot Rod racing. I believe Hot Rods have been responsible for the loss of many top Saloon Stock & Superstox drivers from the sport in Scotland. Many have seen Hot Rods as the pinnacle of the sport & have left the formula in which they have been successful. I personally believed that the Cowdenbeath tracks "square" shape was simply the wrong shape for Hot Rod racing, the quickest line around the track was still the "oval line", clip the corners, wide half way around the corner & wide down the straight. A recipe for continual accidents, usually through a driver diving for the inside of the corner while the other driver comes in to clip the apex. The number of top Saloon Stock drivers who tried Hot Rods (when previously they may have tried Superstox) & then retired is depressingly high. 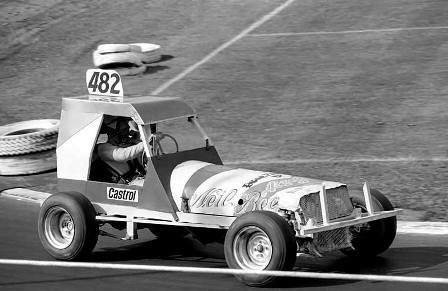 Thus robbing the Superstox & Saloon Stock formula & rarely producing the large numbers in the Hot Rods. Having said all of that one of Scotland's greatest Hot Rod drivers Kenny Ireland stated that he enjoyed racing at Cowdenbeath more than any other track, relishing the challenge presented by the track. So what do I know? On 16.05.76 Hot Rods managed to reach double figures, it was no coincidence that the Scottish Championship was scheduled for the following week. Graham Wait & Kenny Ireland secured placing's in the 1976 European Championship, Graham was 6th & Kenny Ireland 7th. Despite the World Superstox Championship being the highest profile meeting ever to be held in Scotland, we could only muster 9 Hot Rods, a special cup was presented in the final sponsored by cigarette company Gaulisese. Hamish Buchanan won the Open Scottish for Hot Rods having only taken up hot rods half way through the season. The race included the following luminaries World Champion George Polley, Mick Collard, Micky Codling no 566 ,Bob Wilson no 92 ?. Sticky Torrens & Robert Francey from Northern Ireland. 12 cars started the race.